Google entered the hot smartwatch market Wednesday, unveiling two devices, the LG G and Samsung Gear Live. The smartwatches, which interface with Android phones and tablets, will be available Wednesday in Google's Play store, the company said, announcing them at its Google I/O conference in San Francisco. 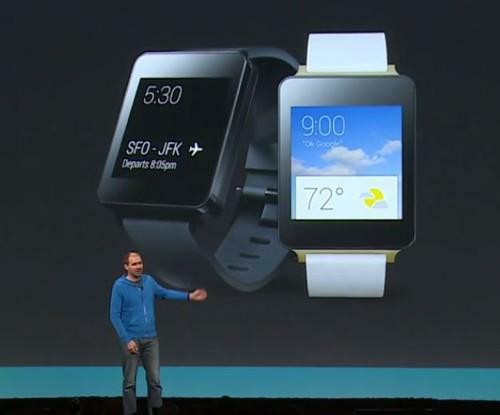 Both smartwatches feature a rectangular screen. Google also unveiled the Moto 360, featuring a round face, but that will launch later this summer. The smartwatches are designed to provide easier access to many of the apps and services people already use on their smartphones. They're powered by Android Wear, a customized version of Google's mobile Android OS, but aimed at wearable devices. The OS is designed to bring snippets of important information to the smaller screen of a wearable device rather than trying to cramming everything onto the display. Instead of Android's typical grid layout, the smartphones' functionality is based primarily around quick taps and voice commands. They are part of Google's efforts to connect a larger number of devices, whether it's smartphones, tablets, wearables or cars. "Users are living in a multiscreen world," Sundar Pichai, Google's senior VP of Android, Chrome and Google apps, said during the conference. "We want to create a seamless experience across all these connected devices." Google is also making available a full Android Wear software development kit, to let developers build apps specifically for the smartwatches. A special version of the Lyft app was demonstrated, showing how a user can hail a ride from the smartwatches. There are also ways to use notes and reminders with the watches, although the system failed to work during a demonstration of a note-taking application. It successfully interpreted what a Google employee said, but it didn't record the note. Google had been expected to launch a smartwatch at the event, having announced its Android Wear system earlier this year.